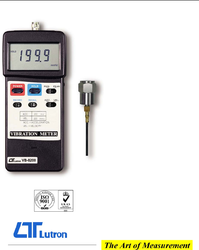 Wholesale Trader of a wide range of products which include digital vibration meter. Our company offer exclusive range of Vibration Meter, which is used for controlling movements of electrical/gas motors and other motion equipment. We fabricate Vibration Meters with precision engineering designs to have excellent operational performance. Modern vibration meters are based on digital technology for effectively controlling the rotations of motors used in Manufacturing Plants and Vehicles. Vibration Transmitter Model: TR - VBT 1 A 4, Lutron, Taiwan, Acceleration : 0.5 - 200 m/s2. Velocity : 0.5 - 200 mms.